You know that old adage, "What doesn't kill you makes you stronger"? Well, there's a flip side to that coin, darlings, and guess what? Falling down the stairs and breaking my neck sure didn't make me stronger. Adding insult to injury, you should've seen that monstrosity of a dress Mother buried me in. On second thought, no, you shouldn't have. No one should have. The words, "I wouldn't want to be caught dead in that outfit" had never been truer. But, as with life, death is what you make of it. And my death is looking up these days. Imagine my surprise when Amanda came right into Shops on Main and started talking with me as if she didn't have a clue I'm a ghost. Of course, she didn't...but even after she found out, she wasn't put off by me. I'm delighted she and her grandfather--a silver fox named Dave--aren't prejudiced. After all, I can't help my condition. As you might in a similar situation, Amanda had a lot of questions for me...some of which I could answer and some I could not. Then she decided to help me. For instance, I told her I love to read but that I hadn't been able to finish a book in decades. Do you know how hard it is to read everything over someone else's shoulder? Especially when that someone doesn't know you exist? Anyway, Amanda showed me how to work an electronic library device. You choose a book, the book pops up on the screen, and you swipe the pages back and forth to read them. And I can do it on my own! Isn't that marvelous? I'm now most likely the best read ghost in Abingdon. How about you--how has technology improved your life? Giveaway: Comment below (don't forget to include your email address!) to be entered to win a $10 Amazon gift card on Valentine's Day! Winner will be chosen at or around 5 p.m. I'm not going to tell you what to do with the gift card if you win, but I'd get a new book or two for my electronic library device! Your book sounds wonderful. Maybe that could be the book or two. Sounds like a fun book! I'll put it on my list. Thanks for the contest! Love your books. Can't wait to read this one! sapphyrias dot books at gmail dot com. Lived long enough to see a lot of changes and let's just say I don't do change well at all. I'm one of few remaining dinosaurs that has a flip phone. I do love the computer though and have been able to keep up with it relatively well - maybe - as long as it's all working properly. Then it's me yelling - DALE (my husband). Do love the way it's improved being able to stay in contact with loved ones more often. Although I still like to receive and get letters, it's nice on the important times not to have to wait a week for the mail to arrive to find things out. Since I love to be in the kitchen, love all the technology advancements in kitchen items that make both fixing food and cleaning up from has afforded me. I can bake more because of the use of things like wonderful mixers that not only beat but do things like knead dough, ovens with convection so that there is no need to turn items in the oven and brown bread so wonderfully, microwaves (I remember my first that was almost the size of a bus compared to those of today) which can do things almost instantly leaving you time to do other things (like read) and let us not forget the much loved dishwasher and it's saving us time, no dishes standing n the drain board and the old dreaded dishwasher rough hands (yes, I've lived many years where I was both the dishwasher and the dish dryer). 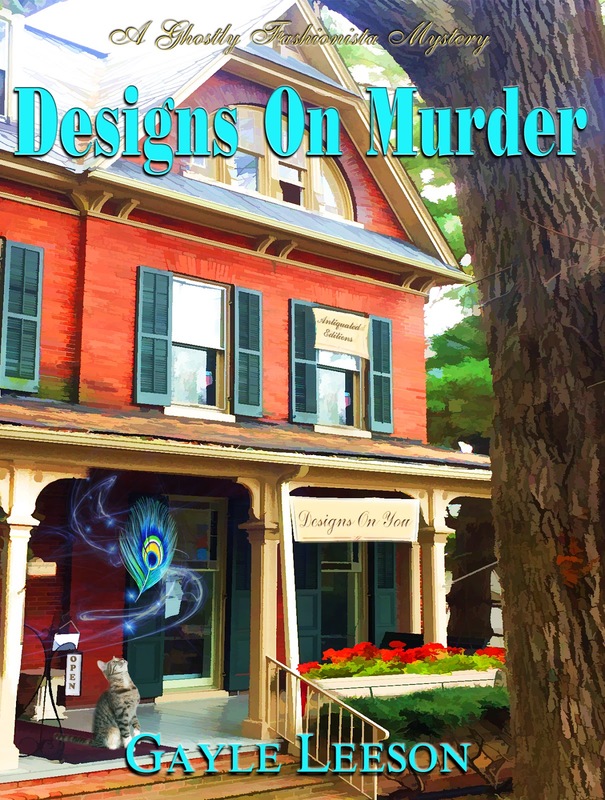 Max from "from Designs on Murder" sounds like a hoot. She could come live in my house any time. :) I would love the opportunity to read all about her adventures. Thanks for the chance to win a copy! I recently discovered google translate. OMG! It's phenomenal. Translates whole paragraphs in seconds. If only I had access to it when I was in school! I love Gayle Leeson!Compared to.My kids,I am a complete helpless amateur when it comes to computers!I will admit I am technologically -challenged but I know all my kindle and how to read and get books!Thanks for a chance to win a great giveaway! I love being able to take my Kindle everywhere and have access to so many wonderful books at my fingertips. I know enough tech stuff to stay out of trouble. I have my computer to read emails and play games on and I have my Kindle to read books on. I still use a flip phone because I only use it for phone calls and a few text messages. Thanks for the give away. Sounds like a good book. Love my kindle, great being able to take it anywhere. This sounds like good fun. Technology has definitely changed my life. A smart phone is like having a computer with you whenever you need it. Loved the synopsis of "Designs on Murder", really looking forward to reading the book. Technology has allowed me to keep in touch easier with my friends and family. Thanks so much for the chance to win! Wonderful giveaway! Technology has made it possible for me to be connected to old and new friends all over the globe. Technology allows me to Skype with overseas relatives. I strongly prefer paper copies because I read so much online. Nice break from it. Technology has made my life even more interesting. I don't go anywhere without my Kindle. I enjoy having a book wherever I go. Yours sounds like one I would like to read. I enjoy reading on my Kindle, but I still like to hold a book and dip thru the pages as well. Book sounds great. I do love my technology especially my new Kindle Tablet! I have yet to read any of your books but as soon as I have funds (we are remodeling our home so no funds for buying anything other than to assistant) I will definitely start getting your books as I love Cozy Mystery! Technology is a blessing and a curse. Somethings go quicker and others never get done. Technology loves to play tricks and quit in the deepest part of a task. Technology is good able to listen to audio in my tablet & take my nookbook everywhere I go & my library has something call Libby where I am able to get the ebooks on my tablet. I can't wait to read this one, it sounds like one I'd really like! Love my kindle, makes books that I wouldn't have had access to easy to "one click" (probably way to much)!! We have a winner!!! Congratulations to Dianne B. I hope you enjoy your gift card! Thank you all so very much for your comments about the new book! I really hope you'll love Max and Amanda as much as I've come to over the course of writing this book and thinking about the next in the series.